In this article I share a list of my favourite Korean movies. I have loved World movies for most of my life and discovered Japanese cinema in my early 20’s with the movies of Akira Kurosawa and Yasujiro Ozu. In later years I explored the cinema of mainland China and Taiwan. I have only been watching Korean movies in the last five years mainly on DVDs borrowed from Stanton Library (sourced from Madman Entertainment) and now on YouTube and other web sites. A few years ago a took a free course at the Korean Cultural Centre in Sydney conducted by Russell Edwards, a Sydney based film critic. He showed clips from many Korean films including what he called the “classic” films. My overall impression of Korean cinema is that too many films are overly violent, dark or depressing. I didn’t enjoy a lot of them but I did find some which I enjoyed and recommend. I have included links to Wikipedia articles for more information and links to YouTube where the movie can be watched online with English subtitles. Why am I learning Korean? The main reasons are an interest in Korean culture, speaking with Korean people and Korean food. 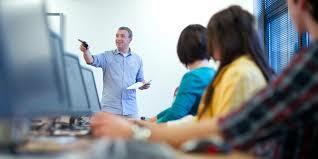 I have been a member of this Toastmasters club (Chatswood Early Risers) for 12 years. Why so long? Haven’t I learn to speak yet? The reason I am here is to keep improving my skills. Just like an athlete or musician – I need to do regular practice. Today I am starting my Competent Communicator manual – for the fourth time And because I am an experienced Toastmaster I like to give back to the club by mentoring new members and evaluating speeches. In recent years I have become more interested in Korean culture, food and the language. I was familiar with Japan but didn’t know much about Korea except for Kimchi, Korean barbecues and Samsung electronics. 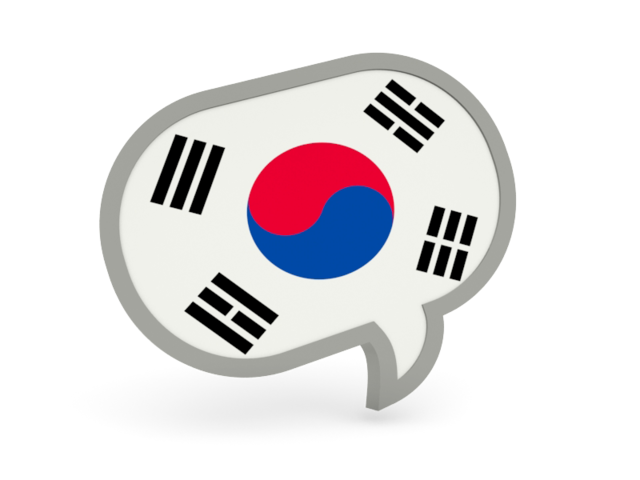 This is a brief account of my journey exploring Korean culture and language. 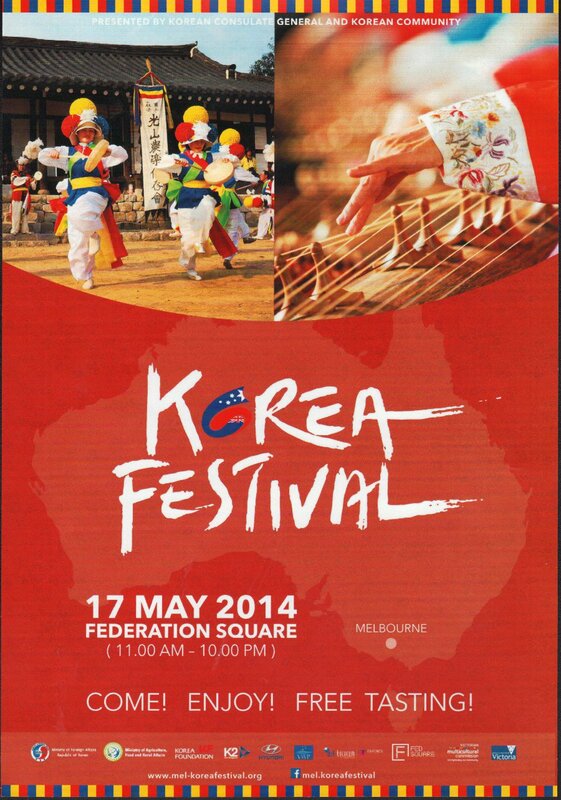 A Korean cultural festival was held in Melbourne on Saturday May 17th 2014. Unfortunately I missed it by one day, so here are the brochures with the details. Links to the official web site can be found at the end of the article. 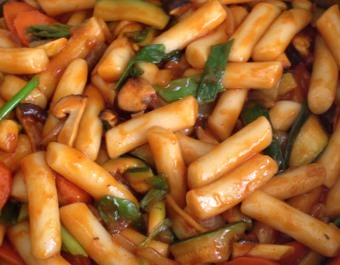 This is one of my favourite Korean dishes – very tasty and easy to make – dduk kokgi (떡볶이) which means “stir-fried rice cakes”. The main ingredient of rice sticks can be purchased in a Korean grocery shop. The recipe is from “Eating Korean” by Cecilia Hae-Jin Lee. 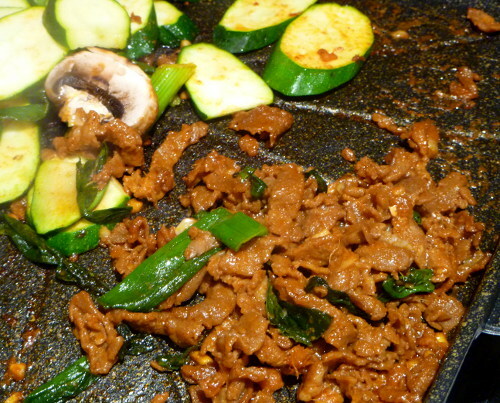 I love cooking Korean BBQ and after having successfully cooked beef bulgogi, I tried this recipe of spicy pork.